Introduction: Laparoscopic surgery for colorectal cancer is excellent in cosmetic and minimally invasive procedure, but is the need for skillful technique. We performed laparoscopic colorectal surgery with the high ligation using automatic stapling device for the purpose of being technically easily. 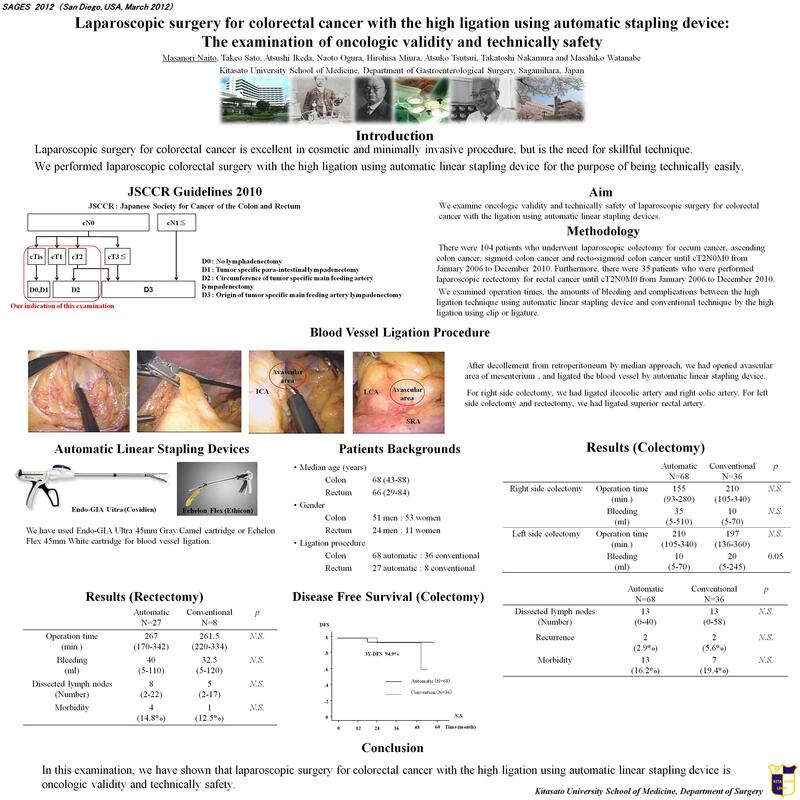 Here we examined oncologic validity and technically safety of laparoscopic surgery for colorectal cancer with the high ligation using automatic stapling device. Methods: There were 104 patients (median age, 68 years, range 43-88) who underwent laparoscopic colectomy for cecum cancer, ascending colon cancer, sigmoid colon cancer and recto-sigmoid colon cancer from January 2006 to December 2010. Furthermore, there were 35 patients ( median age, 66 years, range 29-84) who were performed laparoscopic rectectomy for rectal cancer at the same time. We examined operation times, the amount of bleeding and complications between the high ligation technique using automatic stapling device (instrument technique) and conventional technique by the high ligation using clip or ligature (conventional technique). Results: As for colon cancer, the procedure was underwent the instrument technique to 68 patients and the conventional technique to 36 patients. In the instrument technique, the median number of dissected lymph nodes was 13 (range 0-40). The median operation time and the median amount of bleeding were 155 minutes (range 93-280) and 35 ml (range 5-510) in right side colectomy, and 210 minutes (range 105-340) and 10 ml (range 5-70) in left side colectomy, respectively. In the conventional technique, the median number of dissected lymph nodes was 13 (range 0-58). The median operation time and the median amount of bleeding were 170 minutes (range 95-270) and 5 ml (range 5-80) in right side colectomy, and 197 minutes (range 136-360) and 20 ml (range 5-245) in left side colectomy, respectively. Post-operative complications occurred in 13 patients (16.2%) of the instrument technique and 7 patients (19.4%) of the conventional technique. Whereas as for rectal cancer, the procedure was underwent the instrument technique to 27 patients and the conventional technique to 8 patients. The median number of dissected lymph nodes was 8 (range 2-22) in the instrument technique and 5 (range 2-17) in the conventional technique. In the instrument technique, the median operation time and the median amount of bleeding were 267 minutes (range 170-342) and 40 ml (range 5-110), respectively. In the conventional technique, the median operation time and the median amount of bleeding were 261.5 minutes (range 220-334) and 32.5 ml (range 5-120), respectively. Conclusions: In this examination, we have shown that laparoscopic surgery for colorectal cancer with the high ligation using automatic stapling device is oncologic validity and technically safety.